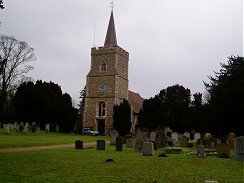 I walked the 5th and 6th links of the Hertfordshire Chain Walk on 15th January 2006. Both links were quite short and as I had plenty of time for once it made sense to combine them. 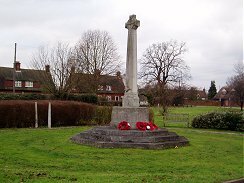 I parked in the small picnic area by the old Letty Green Station and then headed the short distance down the Cole Geen Way to join the Hertfordshire Chain Walk. 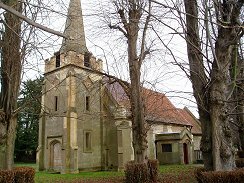 The path continues along the Cole Green Way, photo 1, for just over a mile before turning left and heading along a road through the village of Hertingfordbury, passing St Marys church, photo 2. Hertingfordbury seemed a pleasant little village with a number of attractive buildings although it is rather close to the A414 and the White Horse Hotel seemed a little out of keeping with the rest of the place. From Hertingfordbury the path crosses the A414 and heads up Thieves Lane taking a path on the left that leads up past Lady Hughes Wood and then runs alongside an area of recently reclaimed quarry. 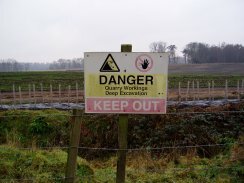 An old sign warns "DANGER, quarry workings deep excavation" however as can be seen in photo 3 the area has now almost completly been reinstated with little sign of the deep excavations mentioned. 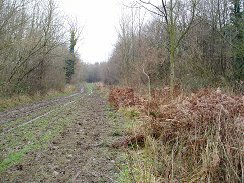 The path continues on to the B1000 before turning right on a track that makes its way through fields and a small area of woodland to a small lane that leads from the B1000 to Bramfield. 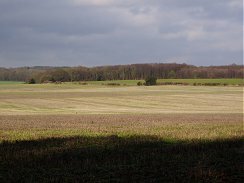 As the walk progressed along this part of the path the countryside opened up and there were good views over the fields towards Bramfield, photos 4 and 5. 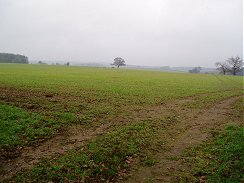 Although once again it was a rather grey and cloudy day this was by far the most pleasant stretch of the Hertfordshire Chain Walk so far and the first part that finally had the feeling of being really in the countryside. An added bonus was that it is an area I have never walked in before. Where the path crosses the lane it joins the route of the sixth link of the chain walk which continues along a track to Bacon's farm where the path splits up. Link five continuing straight ahead towards Red Wood and link six, which I took, heading North past the farm towards Bramfield Park Wood. Between Bacons farm and the wood another farm, Westend Farm, is shown on my OS explorer map although this has now been demolished. Up to this point the paths had been very good but after the site of Westend Farm they joined a route used by horses and became incredibly muddy, photos 6 and 7. Up to this point I had been walking at a reasonably good pace but was forced to slow down considerably to try and pick a walkable route along the path avoding the deepest mud and puddles. 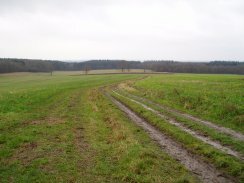 Unfortunatly the path remained in a dreadfully state almost all the way to Queen Hoo Hall which made for very slow going and also made my hips start to ache as my feet kept sliding all over the place, coating my boots in ever greater quantities of mud. 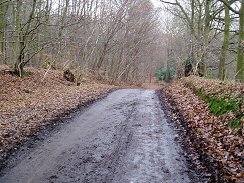 On the way I met a mountain biker who had passed me earlier whose bike was completly siezed up with the mud. At Queen Hoo Hall the path joins a small lane called Tewin Hill, photo 10, for a short distance before crossing a road and heading into Bramfield Woods, photo 11, (as opposed to Bramfield Park Woods). 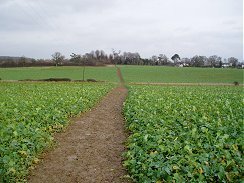 The path crosses the seventh link of the chain walk at this point before turning and heading South towards the village of Bramfield itself. The path passes through Bramfield, passing the church in photo 12 before heading across fields back down towards Bacons farm. 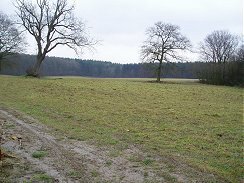 Initially these were over fields planted with some kind of crop, photo 13, ( I wasn't sure what it was), and once again the going was very muddy. 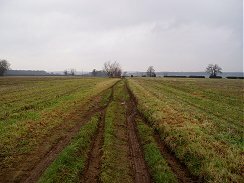 Later the path followed a grass verge along the side of the fields which made for slightly easier going although by now my boots and trousers were well caked in mud. 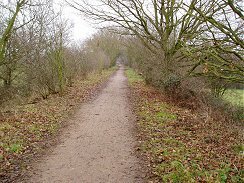 Eventually I made my way back to Bacons farm, completing the sixth link of the walk and this time continued straight ahead to complete the second half of the fifth link. From Bacons farm the path heads round the side of Red Wood from where I took photo 14, looking back over the fields towards Bramfield Park woods. 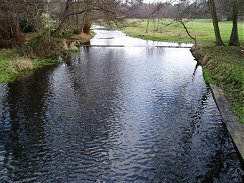 The day had started very grey and gloomy but as I was walking this stretch the sun finally broke through the clouds and the landscape brightened up considerably. The wind also picked up slightly although it was very mild for the time of year. 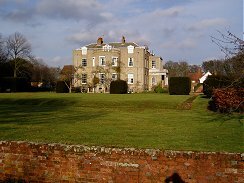 From Red Wood the path crosses a road and heads past a very grand house, photo 15, at Marden Hill where I stopped and had my lunch on a convenient bench. The path then descends down to the River Mimram, photo 16, which is crossed by the little bridge in photo 17. The river was quite shallow and I took the opportunity to have a paddle to try and wash some of the mud off my boots. From the river the path makes its way up Brocket Hill and past another area of reclaimed land on its way back toward the A414 which for once had footbridge to cross over it. 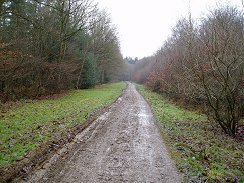 The path passes through Birch Green before crossing a short stretch of field to rejoin the Cole Green Way and the start of the walk. In Birch Green I missed the route of the path which goes through an alleyway that runs through a block of terraced housing and had a little detour round the edge of the village instead. 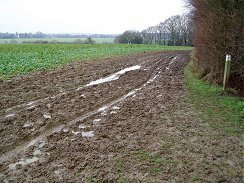 Despite the mud in the middle bit of the walk this has been the best section of the Hertfordshire Chain Walk so far. 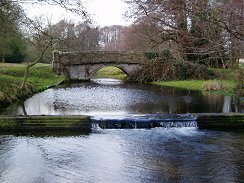 The circular walk from Bacons farm was particularly enjoyable with good views and varied countryside and only a 40 minute car journey from East London although it felt much further away. The GPS made this walk 11.2 miles long.